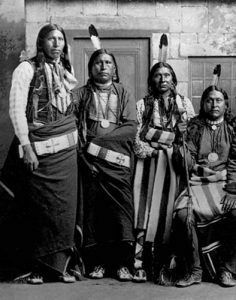 Descended from Caddoan linguistic stock, the Pawnee were unlike most of the Plains Indians as their villages tended to be permanent. Originally, they were an agricultural people, growing maize, beans, pumpkins and squash. With the coming of the horse, they did begin to hunt buffalo, but it always remained secondary to agriculture. The first European to see a Pawnee was Francisco Vásquez de Coronado while visiting the neighboring Wichita Indians in 1541. There, he encountered a Pawnee chief from Harahey, a place located north of Kansas or Nebraska. Little more is known about the Pawnees until the seventeenth and eighteenth centuries when successive expeditions of Spanish, French and English settlers attempted to enlarge their territory. 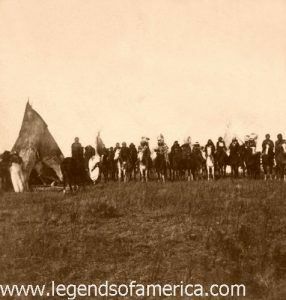 It was at this time that Pawnee hunters first saw horses, racing back to camp, eager to describe the tall, bizarre “man-beasts” they had seen—creatures with four legs, long tails, hairy faces, and clothing that gleamed like sun on the water. Today, the Pawnee still celebrate their culture and meet twice a year for the inter-tribal gathering with their kinsmen, the Wichita Indians. A four day Pawnee Indian Veterans Homecoming & Powwow is held in Pawnee, Oklahoma each July. 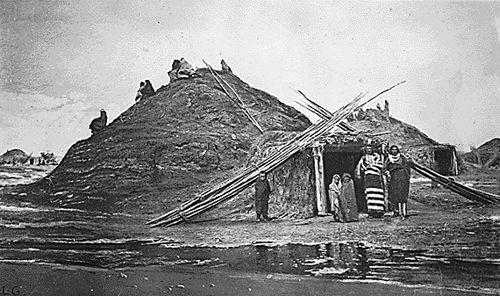 Many Pawnee return to their traditional lands to visit relatives, display at craft shows, and take part in powwows. As of 2002, there are approximately 2500 Pawnee , most of them located in Pawnee County, Oklahoma.